We get a great series of tips via Residential Lighting Magazine from their column called "Ask Randall". I've been saving two to share with you in our blog, and now I just got a 3rd that's great, so that lit my fire to get them out! The client question was: "I always enjoy your columns. One of my favorites was a checklist for approaching kitchen lighting design. 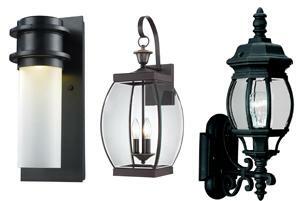 Do you have a similar checklist you can provide regarding outdoor lighting?" 1. 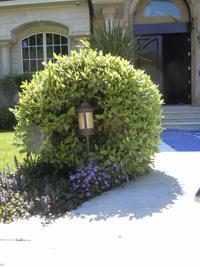 There is no single type of exterior light fixture that can perform all lighting needs in the garden. Light layering is a design method in which a number of different light sources are blended together to create a cohesive and inviting design. 2. Put together a planting plan, an outdoor furniture layout and an outdoor kitchen design, along with sculpture or water feature locations, before attempting to create a lighting design. The lighting should relate to the way the outdoor spaces are going to be used. 3. Try to get all the players (the homeowners, the lighting designer, the landscape designer and the contractor) together to share ideas. This is called a team approach to design. The result is a well-integrated design where all the elements work harmoniously with each other. 4. Create two levels of light; one for when you are inside looking out and one for when you are actually in the garden. Much of the time we look out into our gardens because it is just too cold or inclement to be outside. 5. Try to choose a shielded exterior fixture that can serve as a downlight, accent light or wall wash. Glare can really ruin people’s experience of an outdoor space. Only the decorative fixtures, such as the lanterns flanking the doors, should be seen. 6. Always try to include some exterior lighting in the overall design even if you are working on the lighting inside of your house first. It not only keeps windows from becoming black mirrors at night, but it also visually expands the interior spaces, allowing them to feel larger. 7. Be thoughtful when dimming exterior lighting. Standard incandescent light, when dimmed, becomes even more amber in color. Green plants look sickly under yellow light. Dimming of LEDs is a different story; they do not change color when dimmed. 9. Don’t just locate light switches for the house and landscaping at the front door. Most people enter their homes from the garage. This is where a second set of controls should be installed. 10. Use a daylight blue color correcting filter on the outdoor lights if they are incandescent to eliminate the amber quality. Or specify cooler-colored fluorescent and LED sources which will will keep the plants looking healthy." The client question was: "I am wiring a new room and want to include outdoor wall sconce lights by French doors. I haven't picked out the lights yet, so I want to leave options open as much as possible. What sort of junction boxes should I install: round or single-gang rectangular, metal or plastic? How high? The exterior is lapped siding with a 6-inch reveal." Randall's answer: "First off, I want to congratulate you on having the forethought to add exterior sconces flanking the French doors. This will help keep them from becoming black mirrors at night and add a little architectural jewelry to the facade. As far as a junction box goes I would use a round 3-inch box. This can be a noncorrosive metal box or plastic. It would be really good if you could pick a fixture ahead of time before installing the boxes because that will help greatly in determining what the correct mounting height should be. A good rule of thumb is that the center of the light source should be 6 feet above the patio or deck (whatever the French doors are leading out onto). Some exterior fixtures do not have the electrical feeds exactly in the center of the backplate; sometimes they are closer to the top. Also, some fixtures hang down from an arm, or are raised up on an arm. These configurations affect the correct mounting height. For example, you’ll see the ELK Lighting Freeport fixture (left) has the electrical feed toward the top of the backplate. It’s not centered on the backplate. In contrast, the Quoizel Oasis lantern (center) hangs lower than the junction box. So in this case, the junction box has to be mounted higher than 6 feet so that the light source ends up at the 6-foot height. The Sea Gull Wynfield lantern illustrates a light source situated above the backplate. For these styles, the junction box would need to be installed lower in order for the light source to situate at 6 feet. My advice: Just bite the bullet and find the fixtures that you’re going to use. You need to buy the horse before you hitch up the cart. It will also help knowing the size of the backplate so that you can cut the right size opening in the siding." The client question: "I am changing out the appliances and countertop in my parents’ kitchen, which has an 8-foot island, and we need to change the lights to LED. We’re on a tight budget and can’t do under-counter or accent lighting. If four cans will have to do it all, whose fixtures would you recommend? I’m also wondering if I can get away with 4-inch openings." Randall's answer: "You are asking these four recessed LED cans to do a lot, my friend. When your parents face the counters to do food prep, their backs will be to the recessed fixtures so they will be blocking the light. That’s why undercabinet lighting is so important. The light that comes from four recessed fixtures — alone — will look like the light coming out of four bright flashlights pointed downward. The ceiling will be dark and these lights will cast harsh shadows on people’s faces. It will make the room very uninviting. If you have a center island or a peninsula, I would highly recommend hanging a pendant fixture or two to help create some fill light for the space. You have a wonderfully long island. There are so many ways that you could creatively use that surface … I’m thinking Slip ’n Slide. You can hang a long rectangular pendant or two 24-inch-diameter pendants over the island, centering one fixture on each half. Be sure to pick a good scale pendant. People tend to lean toward smaller fixtures, which can look dinky above a long island. It’s like Cher wearing diamond stud earrings; the scale just feels wrong. As far as recessed LED recessed fixtures go, one company I would have you look at is Cree (www.cree.com/lighting). The company’s 4-inch-diameter can is dimmable and is available in a color temperature of 2700K. 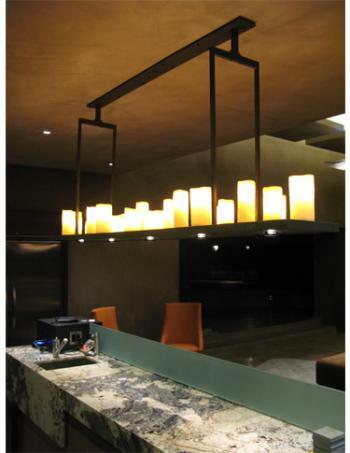 The one that has a little something extra is made by Juno Lighting (www.junolightinggroup.com) and is called the WarmDim. It actually gets warmer in color when dimmed, mimicking the feel of incandescent light, which gets more amber in color when dimmed. Please be kind and give your loving parents the lighting they deserve. They always loved you best anyway." If you want to learn more about Randall, this is his bio: Randall Whitehead, IALD, is a professional lighting designer and author. His books include "Residential Lighting, A Practical Guide." Whitehead has worked on projects worldwide, appeared on the Discovery Channel, HGTV and CNN, and he is regular guest on Martha Stewart Living Radio. Visit his website www.randallwhitehead.com and follow his blog www.lightmakesright.com for more information on books, upcoming seminars and the latest lighting trends.